Media buying basics are what’s all about! Life’s pretty great when you jump on the Mobidea Academy wagon, learning to enjoy the media buying process. You’ve read a little bit about Mobidea’s Mobile Affiliate Network, about how media buying works, and have talked to some of your capital-throwing bros.
You’ve probably registered on Mobidea, and are thinking of becoming a Media Buyer. Maybe we’ve got you all wrong. It may be that you’re already playing the Media Buying master-game but have always been interested to read about stuff that can make you better. Whether you’re the former or the latter, this is the post for you! Why? Because this is where you’ll find everything you need to know. 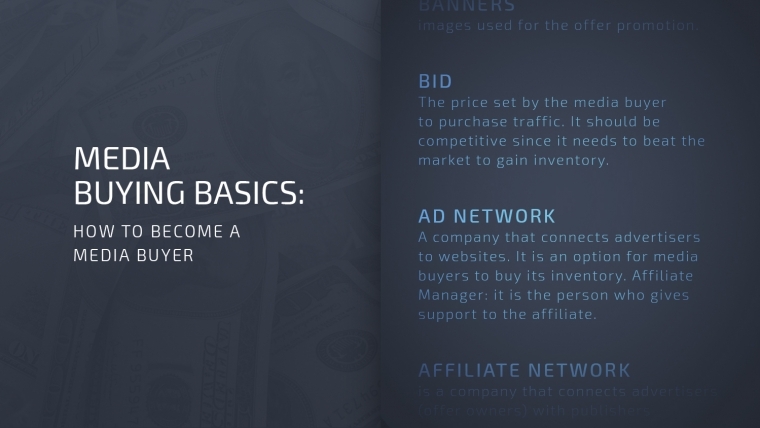 These are media buying basics for you to explore! You’ll also be able to know the type of skills and mindset that turns players into millionaires in Media Buying. Let’s start with the skills that are part of the media buying process. First of all, what is media buying? What’s the actual activity of a Media Buyer? Well, they’re the guys buying ad spaces online. Normally, they do this to promote offers and they’ll make money each time these offers receive a signup, an install, or a registration. Simple. Where do we buy traffic and how does this work? Well, we usually buy from Ad Networks or DSPs, which are known as traffic sources. Wondering how to dive deeper and understand what these terms are all about? Check “Where to Buy Traffic? Direct Buy vs Ad Networks” to know what it’s all about! This is where we’ll launch campaigns, generate data, and where the skills start making a difference. Knowing how to put yourself in the target audience’s shoes. Ready to understand each of these media buying skills more thoroughly? To begin with – before even launching your Media Buying campaign – there’s one of the media buying basics you’ve gotta know. You need to set many things such as which segment you’re gonna pick, your campaign’s targeting, and more details that require great analytical skills, which is the first and main skill we wanna point out. You probably wanna know how to become a media buyer. Well, in order for you to find out, these steps are crucial. Yet, they tend to be overlooked. However, they are super important. In fact, in case you choose the wrong targeting and your media buying process is thwarted, you can pretty much be done before even starting. Well, many things can go wrong. Other awful things we’re too scared to mention! But that’s when the real work begins. As it keeps running and collecting data, you’ll reach the point where you’ll have to analyze this data and optimize your campaign. This is where we get these two new super skills. When you launch a new campaign in a new segment, you’ll certainly spend some money because it’s highly unlikely that right from the start, with an open target, you’ll be super profitable. It’s all part of the media buying process! You shouldn’t think of this as burning money, but rather as paying for valuable data. This is a situation where this skill comes in handy. You can’t panic and stop your campaigns – you have to be calm and trust your critical reasoning. The same thing for when you face tough competition and your margins start shrinking. Panicking is the worst you can do. In fact, it’ll cloud your judgment and this is when bad decisions happen. When analyzing stats, you’ll have several parameters such as device brand, browser, OS and so forth, without mentioning more advanced platforms that’ll contain not only the browser but also the browser’s version. If you think these parameters can come in levels (i.e. inside a specific OS and OS version a particular banner is working better) you can easily realize why attention to detail is mandatory. This game wants you to be fully focused. This attentive mindset will allow you to find the money makers, the gold mines, and that’s where the men are separated from the boys! Apart from the more general skills we’ve just pointed out, we wanna emphasize some more specific ones. Deep, complete, sustained, systematic, scientific knowledge of how the market works. We’re referring to operators, aggregators, traffic sources, etc. It’s important to know how all these players come together to form the business ecosystem. Knowledge about technology is also fundamental. You wanna know how to become a media buyer? You must be tuned into the latest news in the technology world so as to be able to know things that may impact your performance. For instance, if Apple has developed a new Adblocker, this could lower the performance of your campaigns. If a browser has some new features, that may mean you’re gonna lose revenue. Stay tuned, stay sharp, get info, and know how to use it to your own advantage. You’ve gotta be your target. You’ve gotta be able to have an end-user point of view. This means that you should be able to put yourself in the end user’s shoes. That’s how you know what actions are gonna impact the user’s behavior and act accordingly. For instance, think about a certain kind of banner or spot that has a higher chance of having success. You imagine you’re the user. Thinking about your own ideals and likes when doing your thing is one of the fundamental media buying basics! This is the road to success. It’s the kind of path that’s filled with green dollar bills! Now it’s all about mindset. The state of mind a baller needs to have to score points in the Media Buying net! Having the basic skills to start your online Media Buying adventure is awesome. For you to be successful in the Media Buying field, you need the right mindset. We’re gonna go deep into world literature to show you a true gem! Did you feel the difference assaulting your brain and making you see things clearly? Do you know what’s the difference between victorious and defeated warriors? This biz is a war. You’ve gotta be positive before even starting and always have to go for the victory like a true army general! Well, they’re already counting the time it takes for them to retreat, take a warm bath using essential oils, and crying to sleep, wetting their cheaply-made, Ikea-bought pillow! Fortunately, you won’t need to be really called to arms and fight the enemy. However, you’ll be called to bid and fight your competitor. Think you like the war but don’t even know what helmet size to buy? Learn all about it by reading “Bid Wars – A Premium Campaign Case Study on ExoClick“! This is the first genius tip. Having a positive attitude goes a long way. Your mindset defines your state of mind and your state of mind defines your mindset! A brain is a tricky fellow! Grey matter can easily fool you into eating wrong information and making unwanted decisions. That’s why it’s so important to have the right mindset and be in full control mode! In life, you’ll face many things that totally escape your control. In fact, there are many events you simply can’t control. Unfortunately, you’ll also find stuff you can control but, due to lack of focus, you miss that diamond-shaped opportunity. With the correct mindset, these things that shine and make us richer won’t go unnoticed under the radar! With the correct Media Buying mindset, you’ll make it! You’ll be able to anticipate some issues and be prepared to find a solution even before the problem appears! These are the media buying basics you’ve always needed! But what makes up the correct mindset? We’ve already seen that a positive attitude beforehand is great to start Media Buying, but there are more useful tips in order to succeed in this business. In our opinion, willingness to learn and an open mind are essential to be successful in the media buying process. Indeed, a tip that could potentially change your campaigns and put you on the right path to success could come virtually out of nowhere. That’s why it’s also important to be open-minded. Because tips can come from anywhere and they can be different. You just need to keep an open mind, welcoming any feedback that’s given to you. From your own personal experience, you just need to know whether or not to apply that feedback. Open-minded individuals rock this business. Wanna know how to become a media buyer? Media buyers know that the most valuable tips are gonna spring out of the blue. This ability to keep yourself in tune with tips, clues and feedback can help you experience a great media buying adventure. Having given you the media buying basics and an ideia of the sort of mindset you need to have to be on the right path to success while media buying, we’d like to share some tips for you to succeed. Have you ever read those amazing quotes about falling down and coming back stronger than ever? Those quotes point to only one thing: resilience! Resilience is all about overcoming adversity! It’s one of the most important, if not the most important tip we can give you. Resilience is the ability to not be discouraged when facing adversity. And you definitely shouldn’t be discouraged by adversity. You should be challenged by it so as to become the Media Buying master! If you fail today, don’t give up. Get back out there, learn from your failures and use those lessons to do better and better every day. Media Buying is all about learning from mistakes and doing better next time. If something gets you down, learn how media buying works from actually playing the game. Prepare, fight and learn from the media buying process to come back even stronger. A campaign’s going the wrong way? Don’t be sad and disappointed like a little lost lamb. This is so true it hurts: finding the right Media Buying strategy ain’t always easy, but once you do, you’ll see it’s an amazing thing! There’s also something we’d like to point out in regards to finding the right media buying strategy. This is crucial for you to know how media buying works. Once you find it, consistency is key! Feel like you wanna know how to become a media buyer? You need to have the discipline to do your thing every single day and put your strategy in motion if you want to succeed. Jim Rohn once said that “discipline is the bridge between goals and accomplishments”. You need to be disciplined in order to be consistent. If you set your goals but don’t work for them, you’ll never get there, and that’s why discipline and consistency are so important in your media buying strategy. You set your goals, you outline your strategy, you’re consistent in applying it, and you’re disciplined in always working to reach your goals. We guarantee that you’ll be on the right path to success in Media Buying! These are the most important tips we can provide you. You should learn from them, memorize them, and incorporate them not only in Media Buying but also in your life! Nothing happens randomly when it comes to Media Buying. In fact, you’ve gotta work hard for it. Always be patient, keep a calm and open-minded approach. You’ll face some issues you ain’t gonna be able to control but you need to remain serene and super-patient and you need to be understanding and not blame the first person you meet on the street for your personal issues! Sometimes, problems are so huge that people have no alternative and can never fight against that barrier. In that case, you just need to remain in control of yourself and always have a plan B ready to go! Always be prepared for an unfortunate event. Outline a plan B for virtually anything you can’t control while Media Buying. Work smart and look out for market trends. There are some good media buying trends you can capitalize on. Think about the Pokémon GO release. Many affiliates have capitalized on this viral game by promoting offers that were in no way related to the game. All you have to do is keep an eye out for these trends and take advantage at the right time. This is how media buying works. You’ve gotta make the best out of the info you receive and go out to make money. Curiosity will take you that extra mile farther while media buying! It’s important to always keep an eye out for any changes in the industry and even find out new changes even before they occur. It’s fundamental to be one step ahead of your competition while media buying. When you find something new or unexpected, thinking deeper is always the way to go. Don’t swim in shallow waters! Dive deep into the info and make the best out of it. We hope these tips helped you make up your mind and understand what you need to know about your media buying process. Our goal was to put you on the right track to success and define how you should work in the online media buying world! Media buying basics that really help you succeed!